Andrew Cogliano scored on Eddie Lack less than a minute into the game. Dan Hamhuis left the ice on one leg. 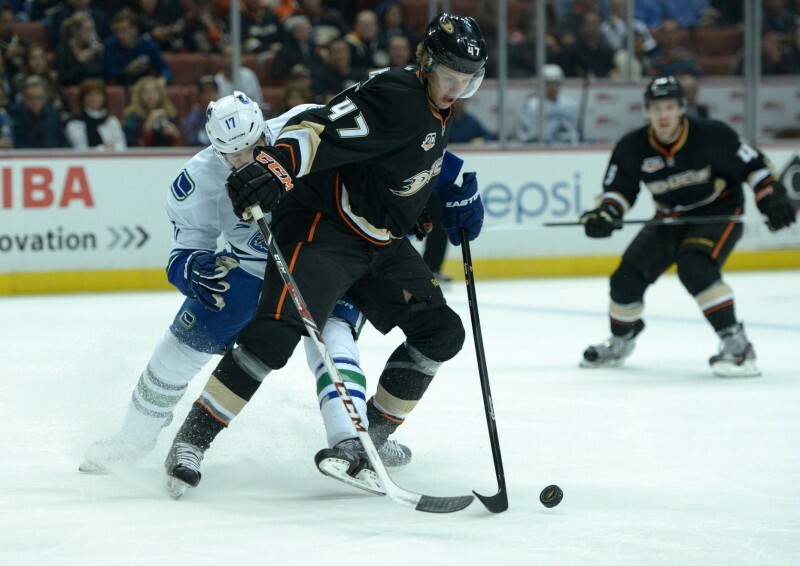 Ryan Kesler defeated his former team at Rogers Arena as a member of the Anaheim Ducks. It wasn’t the way the Vancouver Canucks wanted to write the script, but they shouldn’t sweat too much after their loss to the Anaheim Ducks on Thursday night. There are some home-ice losses that leave fans bewildered and crying out for change (see: Toronto Maple Leafs), but there was an optimistic feeling after the Canucks left the ice following their shoot-out defeat. They were down 2-0 after the first period, but battled back to take a 3-2 lead after two periods. Despite only giving up four shots in the third, Matt Beleskey managed to tie the game to send his team to overtime. The Canucks didn’t look like the tired team until the beginning of the extra frame. Even while the Ducks controlled the play at four on four, Daniel Sedin was inches away from potting his third overtime winner from the season. No one is happy after a loss, but here are three positives the Canucks can take away from Thursday night. Bo Horvat was the first star on Thursday night, even though he almost didn’t play. Horvat netted his first career NHL goal to put the Canucks on the board in the second period. Head Coach Willie Desjardins has trusted Horvat mainly in defensive situations so far this season. He has started only 37% of his shifts in the offensive zone, second lowest on the team to only Brad Richardson. Suffice to say it was nice to see him contribute offensively after playing solid defensive hockey so far this season. It wasn’t just the goal that made Horvat noticeable on the ice. Desjardins matched Horvat against Kesler throughout the game, and Horvat didn’t look out-of-place. He beat Kesler head-to-head in the face-off circle, winning five of eight draws against the ex-Canuck. He also picked Kesler’s pocket on a penalty kill during the second period. 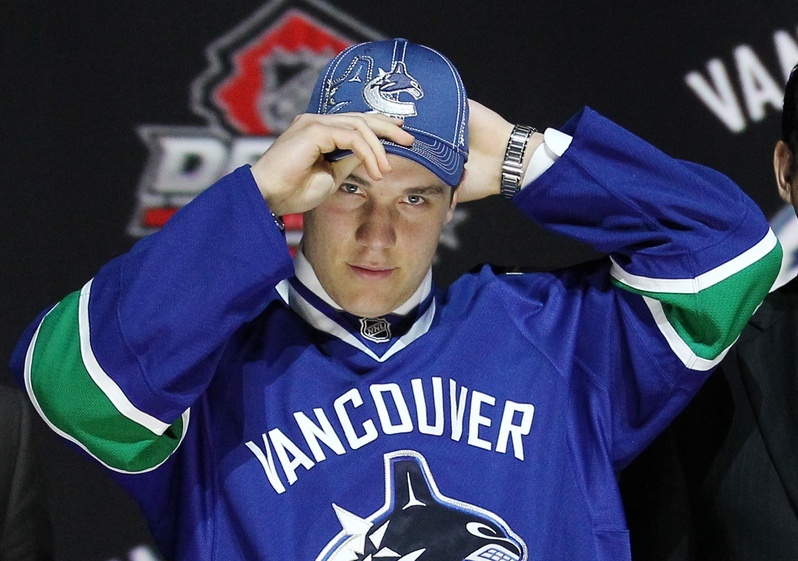 As each game progresses, Horvat is showing that he belongs at the NHL level. If he continues to develop his two-way game, the Canucks are going to have a hard time sending Horvat back to junior. After an abysmal 2-9-3 record against California teams in 2013-14, the Canucks have turned the tides so far this season They have a 2-1-1 record against the trio of divisional opponents. This is far from a cry for celebration, but the Canucks don’t look like the team that got slaughtered against the Southwest last season. Admittedly they didn’t play well against the San Jose Sharks or the Los Angeles Kings on their first California road trip of the season, but they managed to escape with a win in one of those match-ups. However in both games against the Ducks this season, you could argue that the Canucks were the better team. They controlled the tempo of the game, despite being on the second night of a back-to-back in both match-ups. Alex Burrows couldn’t play on Thursday night, and Dan Hamhuis left the game after suffering an injury on his first shift. As if it wasn’t hard enough playing their division leading rivals from California on the second night of back to backs, but they had to do it with five defencemen. Somehow, the Canucks managed to look like the more energetic team until the beginning of overtime, despite their disadvantage. By the end of the game, Alex Edler, Kevin Bieksa, Chris Tanev, and Luca Sbisa all finished with a season high in ice-time. Edler was the leader of the group with 32:24 of total time on ice. If there was a game where it would have been excusable for the Canucks looked tired, it would have been on Thursday. However they persevered and put together a solid performance, out-shooting the Ducks in every period, except for overtime. They also had contributions from all four lines, something that was non-existent during John Tortorella’s tenure in Vancouver. This is one of the main reasons why the Canucks haven’t looked so drained on the second night of back-to-back games so far this season. The Canucks are off to a solid start so far this season in part because of contributions from throughout the line-up.